"Where did you do your DTS?" If you have been in Youth With A Mission, you have heard that question before. But it is usually not a one-word answer. A Discipleship Training School intentionally, physically and spiritually moves you. For three months you leave home to live on a campus with the other students in the school. That campus may be in your home town or across the country. In 2007 we left our home in the midwest and traveled to Salem, Oregon. For some, the campus where their DTS journey begins is in a country far from home. Heading out for our own DTS years ago. But getting to the campus where you live and learn together is just the first step. After three months, just about the time you are getting comfortable with finding your way to buy toothpaste and laundry detergent, another, more drastic change of your situation occurs. Commonly called outreach, it is the MAKE HIM KNOWN portion of the training. (YWAM's mission is to know God and make Him known.) At this point you have been challenged to listen for God's voice, trust Him in new ways, see His heart for every tribe and tongue, and seek to know Him more deeply than you ever have before. Outreach is the living classroom where you learn by doing. For us, that living classroom was the Philippines - Manila, Naic, Kakabay, Baguio, Bontoc, Can-eo, Sadanga, and Sacasacan. Did we do our DTS in Salem, Oregon? Partly. Did we do our DTS in the Philippines? Partly. We did our DTS in Salem and the Philippines. Without the combination of KNOWING GOD and MAKING HIM KNOWN, the DTS would be incomplete. Discipleship is not just to know God. In following Jesus, we have the privilege and responsibility to make Him known. Of course a DTS is just a step in the journey of a life of discipleship. Beginning in January this year, we helped to staff a DTS which began at YWAM Baguio Training Center. We were (and still are) excited to help others on their journey to discover more of who God is and His plan for their life. Our students came from various places throughout the Philippines as well as Vietnam and Australia. One exciting aspect of our work with YWAM has been the opportunity to meet people from so many countries and cultures around the world. The first three months were at the YWAM Baguio Training Center. During that time, we had one-on-one discipleship and mentoring with students, small groups, community activities, evangelism, and much more in addition to the lectures. I really enjoyed my one-on-one times with James and Junior. We would discuss what was going on in the lectures, their families, and their hearts. It was exciting to see the changes that God was bringing about in their lives. It was a privilege to be invited to be a part of the process. 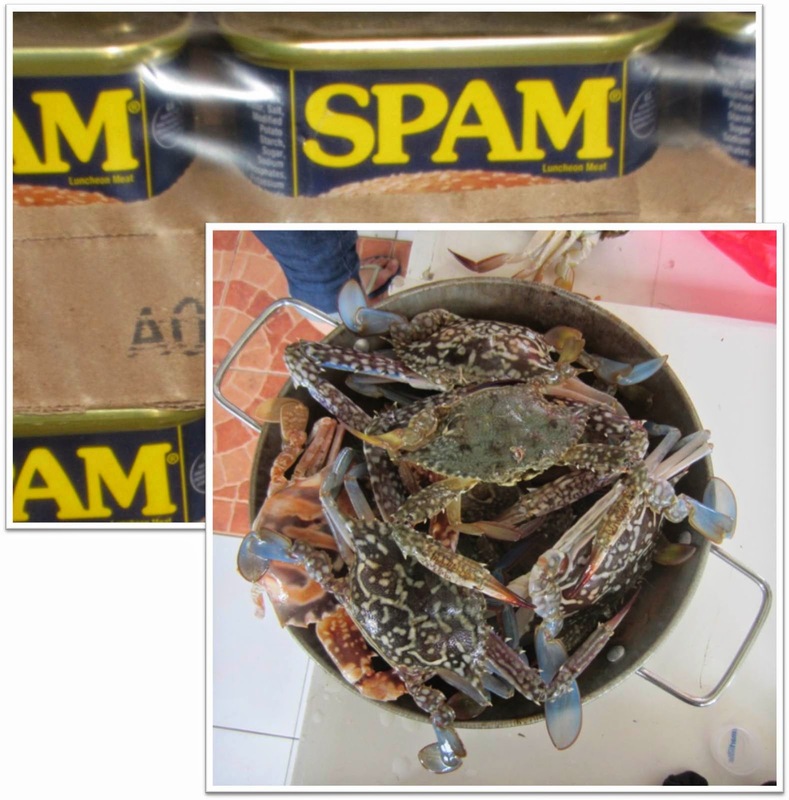 James with a Camiguin lunch - or is it breakfast or dinner, hmmm? Camiguin Island has three communities. For those places with electricity, it is supplied by a generator that runs from 6:00 - 10:00 pm. Fuel has to be brought over on a boat. It is 4-5 hours to the mainland in good weather and in bad weather, no boats make the trip for cargo or people. Hand pumps are the source of water, and many wells are somewhat brackish (imagine unflavored Gatorade). There is no hospital and only 1 high school on the island. Only one of these communities has an established, functioning, biblical church. Annalise and I spent two weeks on the island with the team. During that time we enjoyed the peaceful, slow pace of island life. There was plenty of time for talking with people. One day I spent a long time talking with one man as he relaxed in his hammock under a thatched shelter with his fighting rooster on a leash nearby. How do you solve the problem of a disintegrating sandal on a hike between villages on a small island in the Pacific? With duct tape of course! As a team we went from village to village, doing open air evangelism, dramas, and Gospel film showings. People were so open to hear what we had to share of God's great love shown through Jesus Christ. I remember one night, at the beginning of our presentations, only a few had gathered. But more and more came as dramas and testimonies were shared. Afterward the team sat with different groups talking and praying with them. We still had an hour's hike in the dark to return to the place we were staying that night and when we had to say good-bye, the people were sad and reluctant for us to go. It may seem silly, but perhaps one of my fondest memories of my time on the island with Annalise comes from a funny thing she said. Before the trip we were talking with her about how she would not be able to be particular about food. She had been adamantly against eating fish for many years and since there is no market on the island, it was obvious that fish and rice would be the primary foods. (Yes, rice and fish for breakfast, lunch, and dinner.) Well, one day we were sitting in the shade after swimming in the clear waters around the island and she dreamily states, "I could live here forever - fresh fish, rice, and noodles." After two weeks, Annalise and I took the team back to the mainland where they continued ministry for another week or so. I had to get back to prepare for the first session of PHILEO Response Team training. Later, the team returned to Camiguin Island to follow-up with the work that was begun there. On the second trip, I had the pleasure of Alayna's company. Alayna and I were separated during the first week of our ministry. 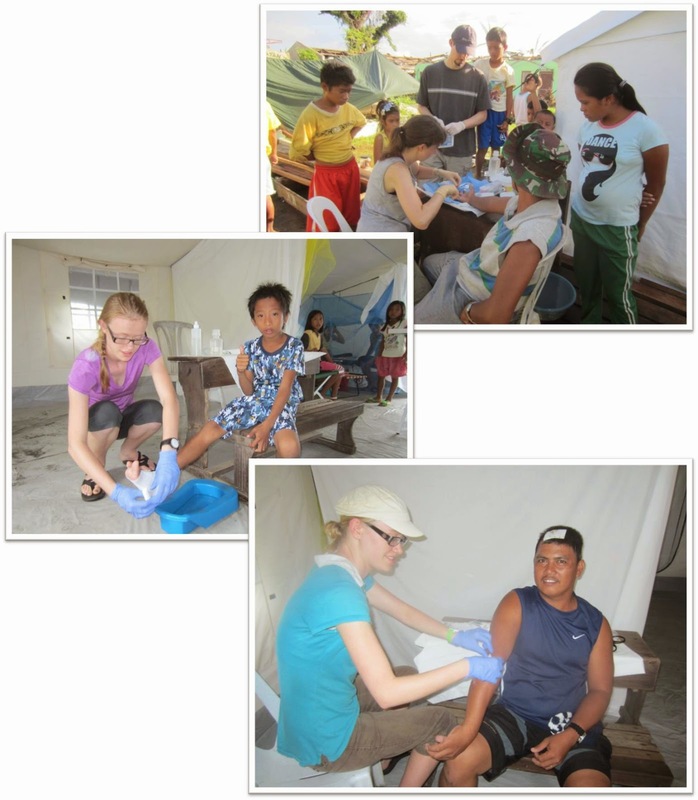 She went to the village of Minabel to spend time with a local missionary's family. I continued to lead the team in Naguilian. By this time in the outreach, the students were really doing a great job. My "leading" became more of an ongoing process of one-on-ones with the students and younger staff. We talked with people along the road and in their houses. This led to starting a Bible study with a couple families. We also distributed Bibles in the Ilocano language so people could continue to learn more about the magnificent salvation we have been offered. At the end of June, both parts of the DTS were complete and it was time for the students to graduate and move on. "Where did you do your DTS?" I don't know if they would answer Baguio City or Camiguin Island - probably both. But that was just one step in the journey. "Where are you going?" is now the question to ask. Several of the graduates have already entered into some sort of missionary work with YWAM. We pray that each student who completes a DTS, like all disciples, can answer without hesitation, "Wherever HE leads me!" PHILEO - Do You Know What it Means? PHILEO - a Greek term meaning brotherly love. After the destruction of Supertyphoon Haiyan/Yolanda, the leaders of our ministry here in the Philippines decided it was time for us to create, train, and equip a response team. 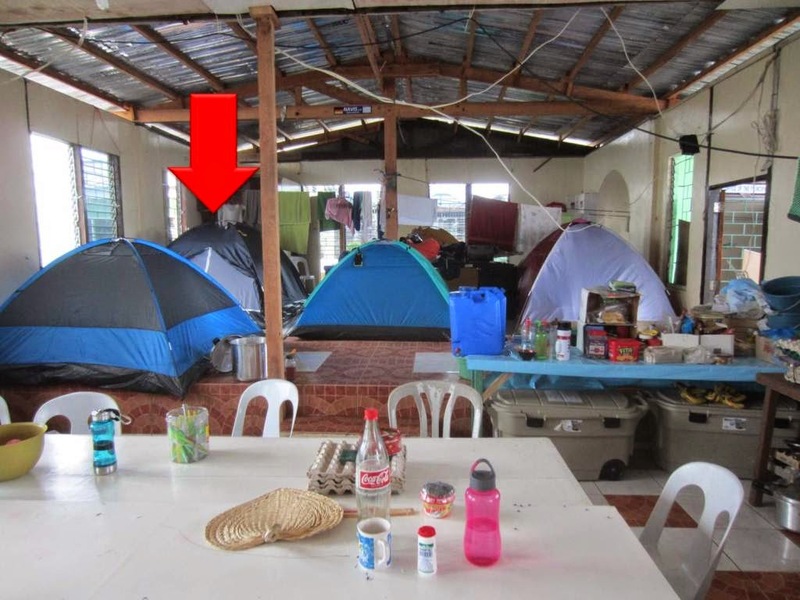 Along with a former US Marine who has now served with YWAM Philippines for a couple of decades, our family has worked hard to establish the PHILEO Response Team. The PHILEO Response Team is a group of trained volunteers. Our heart is to be hands of mercy in times of need. We have held two sessions of initial training so far. In May, we held the training here in Baguio City. Just a couple of weeks ago Alexie and I traveled to Talisay on the island of Cebu to facilitate the second session. During the course, participants are stretched physically, mentally, and spiritually as they learn the basics of first aid, water rescue, search and rescue, rope rescue, relief distribution, and living in disaster zones. At the end of the week, everyone is looking forward to sleeping in a bed, eating something that wasn't in a can, and taking a bath. But at the same time, they feel they have gained a lot of skills, made some new friends, and learned more about themselves. When we were in Talisay, we had our first official PHILEO response. As we were hiking, we came upon a motorcylist who had several cuts and abrasions after falling trying to avoid hitting some dogs in the road. We cleaned and bandaged his wounds and prayed for a quick recovery. Tom cleaning and bandaging wounds during a training hike. The Philippines regularly experiences earthquakes, landslides, volcanoes, and storms. Just this week Typhoon Glenda threatened the southern portion of Luzon, which includes the densely populated region of Metro Manila. If you are interested in helping equip the team, please check out the equipment registry we have established at myregistry.com. Consider purchasing one, or several, items to equip us to be hands of mercy in times of need. 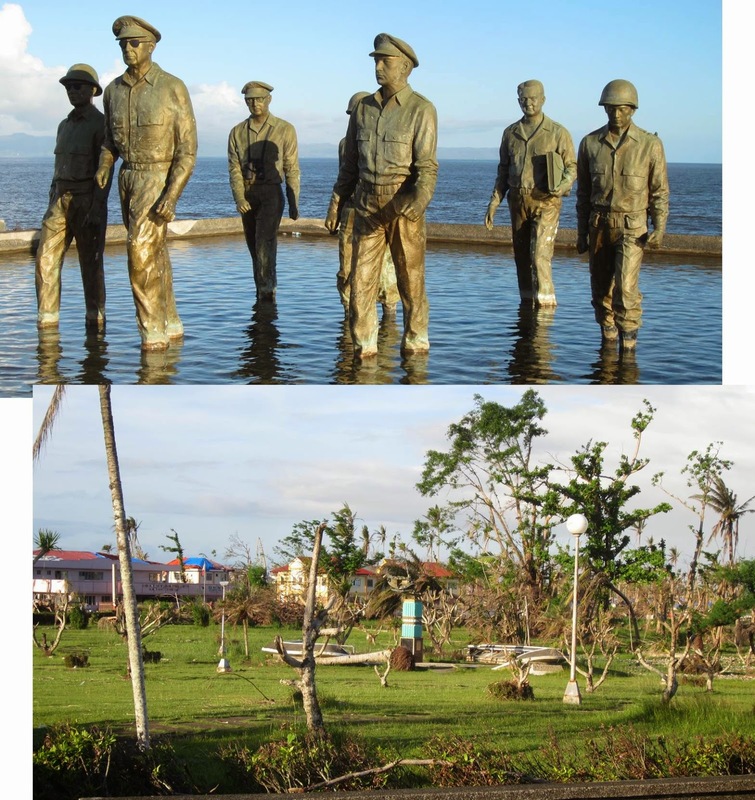 Just after Christmas I made another trip to the area affected by Supertyphoon Haiyan. This time I had the privilege of bringing my daughter, Alexie, with me. We went to Dulag which is about 45 minutes south of Tacloban. 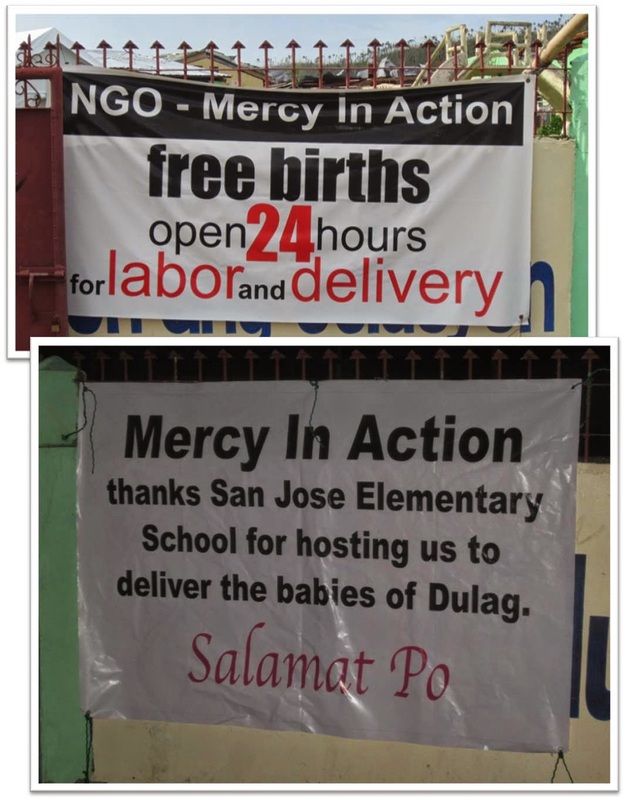 We assisted a group called "Mercy in Action", a group of midwives who had established a temporary clinic at an elementary school. Since I have done a poor job of updating this blog, I am going to cheat, while at the same time giving you a better experience, by publishing Alexie's report of our experience. By the way, "Ate" and "Kuya" are respect terms for "big sister" and "big brother" expected to be used when talking to or referring to someone older than you in the Philippines. The day after Christmas, Dad and I got up really early so that we could get the 6 a.m. Joy bus to Manila. This trip is about 7 hours. When we got to the airport, the guy from The Philippine Bible Society met us with the 50 Wari Bibles Dad had ordered. We had a lot of luggage. We checked in. The line was quite long to go to Tacloban. This actually surprised me. 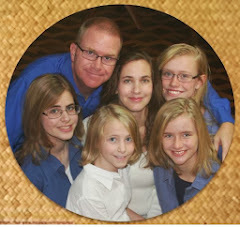 We sent a text to Pastor Duane and Ate Christina. They are Ate Norlyn’s friends that work with Hands of Hope. We were meeting them at the airport and Ate Norlyn would come the next day. Buses took us to the plane. It was only an hour trip. We circled twice before actually landing at the Tacloban airport. The airport is right by the ocean. They brought the luggage in big carts and everyone grabbed their luggage. Kuya Tanno brought the “Mercy in Action” ambulance to take us to Dulag.We stopped at the MacArthur Monument. It was very cool. There were statues of soldiers wading in water. They were in good shape but the rest of park was not. All along the way, I looked outside. Everything was broken. There were big piles of debris. The sun, the sea, and the palm trees made everything look beautiful despite of everything. But the smell was not often beautiful. I think that the people are very strong. They are resilient. And they have hope. When we arrived, Ate Vicky (director of Mercy in Action) met us and showed us around. She asked what we saw ourselves doing. I was too shy to say. I was so glad that Dad did. I wanted to help medically. Pastor Duane, Christina, and I were assigned to cook. Dad was going to help in the Medical Clinic. We set our tents outside on the cement below the overhang. There were holes in the overhang. We ate dinner with them and started to make up the packs for the new mothers of supplies we had brought with us. These packs included a Bible, a package of 12 diapers, a baby shirt, 2 diaper wraps, a water filter, and a mosquito net. The next day, Pastor Duane, Christina and I took a motorcycle to the market or palingky. They wanted to get some balls and I wanted to get buckets for the water filters. We found buckets easily but not balls. Not many shops were open. In the afternoon, one of the midwives, Ate Michelle, was going to get load for her phone invited anyone who wanted to go to go with her. Dad wanted to. About 5 minutes later, she came rushing back asking for Dad's EMT bag and then again for the ambu bag. I was frightened and went out to see what was going on. There was a big crowd of people around the lady who was down. When she became conscious, she resisted help. Finally they got her into the back of a big truck. Kuya Nick, who is an ER nurse, Dad, and Ate Norlyn went in. Ate Norlyn had just arrived when she jumped in to translate. I had struggled with starting to cry earlier but once we made it back in the clinic, I really did start crying because I was so overwhelmed and Dad was gone. Later, I went with Pastor Duane and Ate Christina went to a Sari-Sari store and got tomatoes, eggs and onions for dinner. All the kids followed us. I also got to experience a birth. Kuya Tanno said that there was a labor so Ate Jenny, the nurse that I was following, and other people rushed in there. I followed. I was unsure of what to do but Ate Vicky said that if I was going to be in there to get some gloves on and help so I did. She asked me to hold the mom’s hand. She did not scream. Her water broke and there was also some blood on the floor. It happened really fast. I was asked to take pulse every five minutes but I could not and it was too much pressure so someone else did. I put the baby hat on the baby girl. I spent the next few hours with her. Ate Christy was with me most of the time. We checked her pulse and did a fundal check every so often. We also did some paper work. The baby was nursing and the mom resting. Then 2 hours later, we clamped the cord on the baby’s side and I got to cut it. When the mom went to the CR (comfort room, or bathroom), I got to hold the baby. She had to change her clothes which were sweaty and bloody. Later the baby had her check-up. They gave her a shot of vitamin K and something else. Ate Norlyn, Ate Christina, and Pastor Duane left. Pastor Duane’s nickname for Dad: MacGyver! Sorry I can not divide it up by day much anymore. Soon after, I was able to follow Ate Tara around. She was doing prenatals. She would feel the position of the baby and measure the fundal height (height of uterus). I took some blood pressure. Also they checked her hemoglobin. I got water if they needed to take some medicine. I also had to cook so I left early to cook. It was hard to cook by myself. I decided to start working in the medical clinic. Kuya Nick was amazing. He let me listen to lungs and then he told me the sound. He always would let me do stuff and include me. I learned a lot. I got to put on steri-strips. One time we made crab grilled cheese sandwiches together from the crab a patient brought. They were amazing and fun to make. Kuya Nick said that how I could make money for college would be to sell these from a van in dreadlocks. A 14-month old came to us with burns all over her chest and side. They had been boiling vegetables and she had tipped them over on herself. She cried herself to sleep. They dropped I.V. liquid over the burns while Ate Jenny de-brided (cut off the dead skin). She woke up as they were dressing her burns with ointment and gauze. She was crying so hard that I started to cry. Her eyes pleaded me to help her but I could not. She even reminded me of Kiera, a little girl from Bontoc, so it was so much harder. We heard later that she is doing well. Working at the medical clinic, I usually signed people in. I would get their name and age and see what was wrong with them. We had people come in for so many reasons. Most came for cough and cold. Puncture wounds were not uncommon. Several times we also had motorcycle accident victims come in. One guy had a snake bite. A little girl had drunk kerosene. We also had asthma patients come in which was usually small children. We did a lot of wound care too. I also did a lot of wound care. It was nice to do daily dressing changes as we got to get to know people and their names. One was Kuya Michael. He had a wound on his head and his arm from a motorcycle accident. Then there were siblings, Ray Gerald and Alyssa Mae. They had been involved in the motorcycle accident that had happened the first day. Ray Gerald’s foot was raw on one side. Alyssa Mae had some cuts on her face and shoulder. There was some concern for her shoulder. It was so cool because, while I was there, I was kind of in charge of giving out A-20. This was a food supplement from America. Whenever someone came for it, I would measure their MUAC (measurement of their upper arm), get the mother’s name, age, how many times she had received aid, the age and gender of her nursing baby, her barangay, and cellphone number. Then I gave the aid. It was also for the pregnant ladies. I took pride in handing out American aid. We had to move because the wind was so strong that it would blow our tent which was scary. We moved into the medical tent. We would set up at night and take down in the morning. We moved once more inside the building because they needed room in the tent. One time a little baby came in who had reached for some rice. She had burned all her hand. She was such a cute baby. Usually as long as she was nursing, she did not cry when she came back every day for dressing changes. I got to hold her some. One time, a little boy came with asthma. The treatments did not work and we could not understand each other. It was so sad. I was glad that I could understand some of what he said like when he asked for water or to use the CR. The family did not have money. Kuya Matt gave them money so that they could take the ambulance. But they had to go the opposite way to get the ambulance. This was so hard for me. Once school started, we took care of students whenever they got injured. One little boy was very scared. I was trying to stop his arm from bleeding and he would pull away. They had to hold him down for a tetanus shot and to clean it and put on steri-strips. It was very hard to see us have to force him to let us help him. His mom came while we were cleaning it. I learned so much from my time especially with the three nurses in the medical tent: Kuya Nick, Kuya Matt, and Ate Jenny. They all taught me so much. I loved playing with the kids. They all knew my name. I gave high-fives as I went in and out. They also gave me some flowers. One day I did some gymnastics with them. It was fun. They were so sweet. Katrina was a sister of a new mother. She is eleven. She slept in the big tent and we did too for a while. She swept the tent especially after she saw dad sweeping. She was very interested in medical stuff. Dad showed her how to use a stethoscope. She helped me with A-20 some too. She is very sweet. She and I spent some time together. When Dad showed the Jesus film in Tagalog, she and I watched it together. We got to take pictures together. Trisha was one of the triplets. She and Nicole were so sweet and we spent some time together. Trisha's brother hit his toe when he was playing soccer with Dad so we changed his dressing. Christian was one of the boys. His parents are not together. He lives with his Grandma. He speaks English very well and is very bright. We also talked and spent some time together. There were NAVIS doctors from Germany that came in the afternoon. They were a great resource to us and gave us a break.